Posted on 24, January 2019 by EuropaWire PR Editors | This entry was posted in Business, France, Internet & Online, Management, Technology and tagged Accenture, Atos, automation, Capgemini, Claudio Da Rold, Cloud, Cognizant, Computacenter, David Groombridge, digital transformation, DXC Technology, Federica Troni, Futjitsu, Gartner, Getronics, HCL Technologies, IBM, Jean-Philippe Bol, Managed Workplace Services, MWS, MWS market, NTT Data, Ricoh, Stefanini, TCS, Unisys, vendors, Wipro. Bookmark the permalink. PARIS, 24-Jan-2019 — /EuropaWire/ — Capgemini today announced that it has been positioned as a Leader by Gartner in its Magic Quadrant for Managed Workplace Services (MWS), Europe report. It was one of sixteen vendors to be evaluated on the ability to execute and completeness of vision. The Connected Office: One aspect of the employee experience that’s often overlooked is physical spaces and office facilities. Connected Office makes it easy to interact with the physical office environment. Find out more. Gartner Magic Quadrant for Managed Workplace Services, Europe analysts are David Groombridge, Claudio Da Rold and Federica Troni. Other leaders include Futjitsu, Atos, HCL Technologies, IBM, DXC Technology, TCS and Wipro. 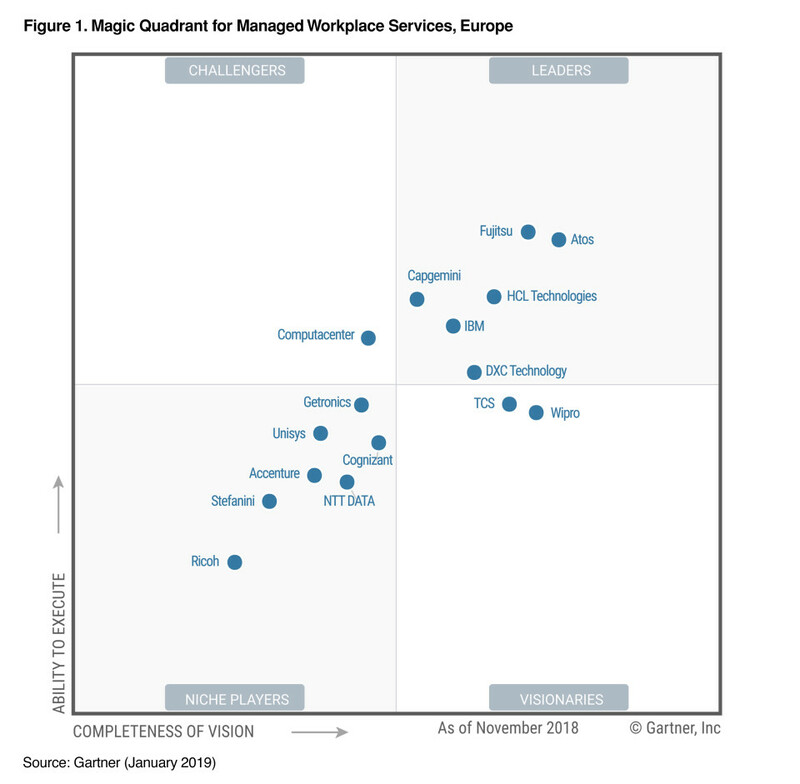 While the Magic Quadrant for Managed Workplace Services, Europe challengers are as follows: Computacenter, Getronics, Unisys, Cognizant, Accenture, NTT DATA, Stefanini and Ricoh.